Apparently, that wasn’t enough for the insurance companies. 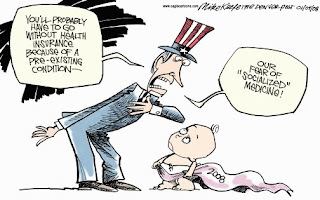 WellPoint’s Anthem Blue Cross & Blue Shield, Aetna, Cigna, CoventryOne, Humana, and UnitedHealth Group’s UnitedHealthCare have all said they will stop writing new child-only policies in one or more states, according to reports from Dow Jones Newswires and The Hill. The affected states include Colorado, California, Ohio, and Missouri. So rather than comply with the new rule that they can no longer discriminate against children with pre-existing conditions, these insurance companies have instead said "screw you guys....I'm going home!" You can almost hear the temper tantrum that took place behind those board room doors: "No big-government socialist is gonna make us cover kids with pre-existing conditions if we don't feel like it, by God! Unfettered Market For Life, Baby!!!" To think there was a time when people actually debated the public option. Are the Companies right or wrong here to protest this government regulation? Besides a pure interest in making a profit, is there any valid reason for Insurance Companies to refuse to cover any more kids with pre-existing conditions? And for extra credit, if this is the response from the Health Insurance Companies now, what happens on January 1, 2014 when these same rules will apply not just to kids but to ALL of us?